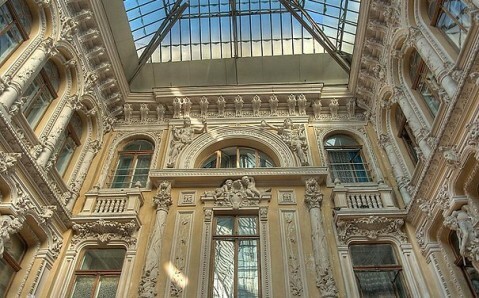 Located on the corner of Deribasovskaya St. and Preobrazhenska St., the historical and architectural complex “Passage” is reckoned to be one of the finest buildings in the city. Its chic, richly decorated edifice is included in Top-10 of the architectural masterpieces of the Southern Palmira and it’s considered one of the most famous sights in the city. 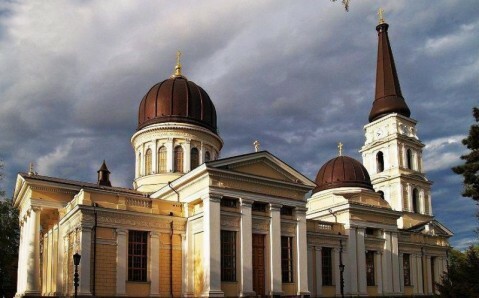 The luxurious, eclectic building, whose exterior combines baroque, modernism, classical style, was constructed in the end of 19th century in record time – it took only two years to erect the edifice from the foundations’ laying till the inauguration of the complex. 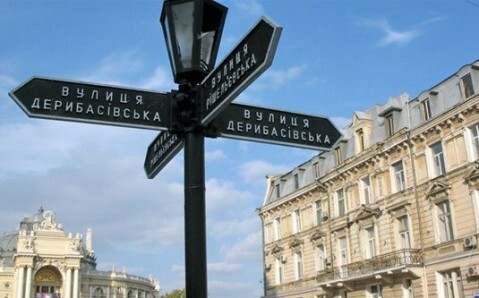 It was commissioned by Odesa merchant, the head of big export company, Moisey Mendelevich, who purchased houses that stood there to build enormous shopping mall and a hotel. The newly constructed building was named “Passage”. It was a completely new type of the shopping arcade. 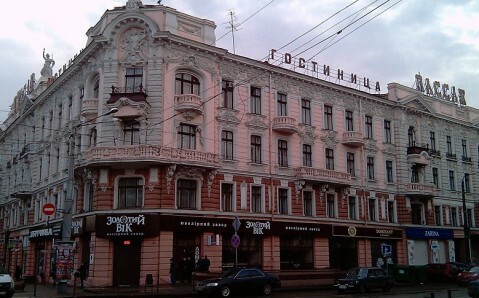 Formerly it was usually formed with long shopping rows, arranged in one or two floors with shops and galleries, but that time all the commercial operations were carried out indoors. 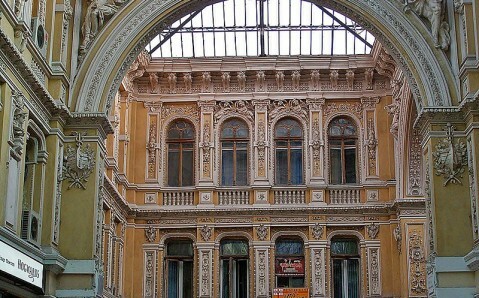 The shopping arcade occupied the first floors of “Passage”; because of privileged location, the shopping mall housed the most prestigious shops in Odesa. The superior levels featured a hotel. It numbered 162 comfortable rooms and was equipped with state-of-the-art technologies. The hotel had electric lighting, provided by autonomous power plant, steam heating system, elevator, and telephone lines. Also, it offered the services of restaurant, reading room, hairdresser, and post office. 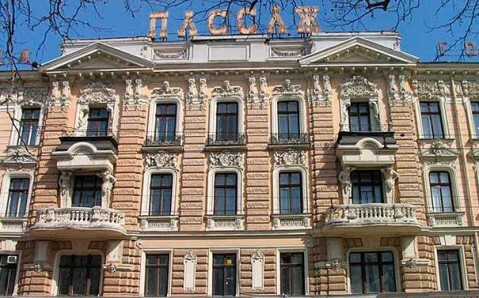 From the very beginning, “Passage” was considered the best hotel in Odesa and was very popular among visitors. As of now, unfortunately the hotel isn’t as great as it used to be – its rooms don’t offer the same level of comfort and cutting-edge technologies. However the complex itself has remained unchanged and still locals and tourists alike consider its beautiful building a treasury of local architecture. 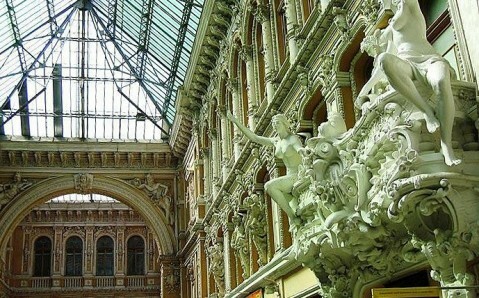 “Passage” is prominent due to its pompous facades that feature a lot of baroque stucco ornaments and chic sculptures. The most famous are statues of Mercury and Fortune holding a torch of success on the complex’s roof. 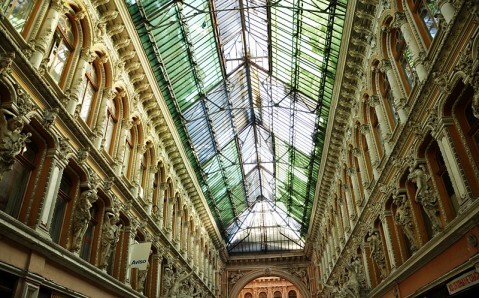 The main characteristic of Odesa “Passage” is flanked with shops long indoor patio that represents a certain skylight atrium, a so-called light lantern. Along with building’s facades, the interior walls of the atrium are impressively decorated with skilled stucco patterns, masterfully executed marine-themed sculptures, Atlants’ figures, dragons and other creatures and ancient heroes. В ближайшее время здесь можно встретить много "звезд". 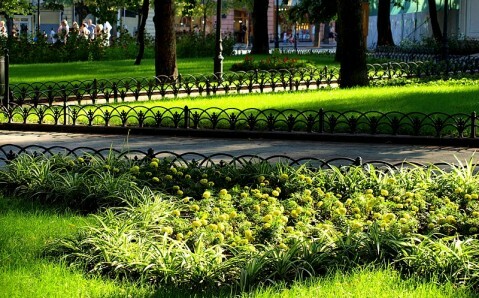 Безумно красивое место. Одно из самых красивых мест Одессы. Но не помешала бы хотя бы минимальная реставрация. © 2019 Discover Ukraine. All right reserved. No part of this site may be reproduced without our written permission. The website is owned by Discover Ukraine LLC.